I’ve always been a fan of lemon chicken. Regardless of the preparation, the combination of lemon with poultry is a winner in my book. From stuffing whole birds with fresh citrus to lemon based cream sauces, you can’t go wrong. Best of all, when done properly, it can be a flavorful and health conscious meal. 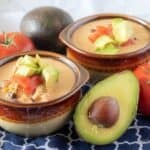 Since we’ve been asked, by readers, to share more Instant Pot recipes, Kim and I wanted to provide some healthier alternatives. 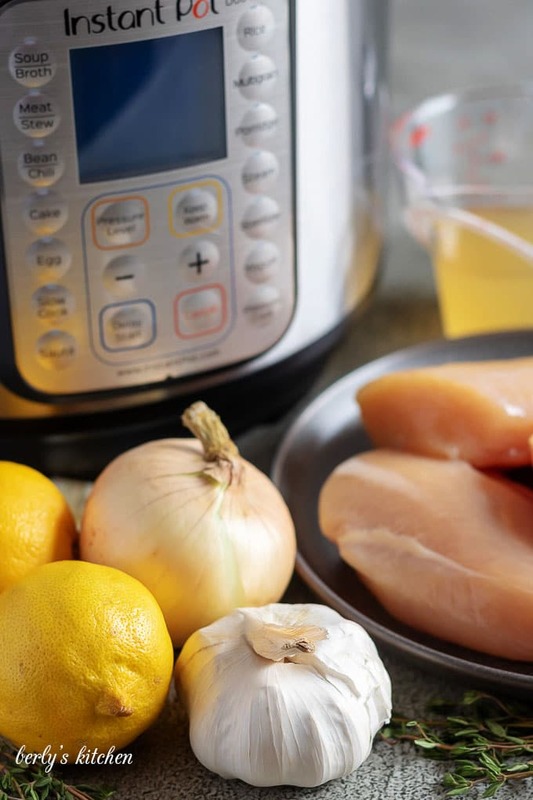 Enter our Instant Pot lemon chicken recipe. Don’t get me wrong, I love cheesy pasta dishes and sugary desserts too. But, the truth is, you can’t eat like that all the time. I mean you can, but we know better and we know the consequences. My apologies, I’ve gotten off track here, the purpose was to write about a chicken dish, not preach to my readers. Getting back to it, there are a lot of advantages to cooking meat with citrus ingredients. For starters, not only does it add flavor, it’s an acid. Acids can actually help, “cook,” meat. Think of ceviche, as an example. Sure, the meat is still technically raw, but it’s safe to eat because of the way lemon juice works. Also, you can use it to make a simple buttermilk, using lemon juice and milk. The list goes on and on. For today’s recipe, the lemon will serve as a flavoring agent. With that being said, I hope by adding a little extra information, I’ve sparked interests. Now, onward to the recipe! There are quite a few steps for this recipe. But, I’ll try to consolidate them (and add a little extra information) here since everything is neatly explained in the card below. First, gather up your ingredients and turn your pressure cooker on using the saute function. Next, once the liner is hot, add the chicken breasts and oil and give them a good sear for 3-4 minutes on each side. The sear will lock in all the juices. After that, take out the breasts and add the onions so they can saute, as well. When they’ve saute’d for 3-4 minutes, add the garlic, salt, and pepper. Let everything cook for another 30-45 seconds before pouring in the lemon juice and chicken broth. Personally, I don’t see any reason why you can’t just toss everything in together and seal machine. However, keep in mind that your chicken might be dry if you skip the searing. Then, add the chicken breasts back to the Instant Pot and put the lid on the machine. Turn the valve to, “sealing,” and press the Manual (high pressure) to cook for 8-minutes. Please allow a 10-minute natural release once the timer goes off. Doing so will ensure the meat stays tender. One thing you could do is start making your side dish, something like oven roasted potatoes might be a good idea. Another option would be saute’d broccoli or cauliflower. Afterward, remove the chicken from the liner and use cornstarch and water to make a slurry. Put the pressure cooker back on saute. Last, add the slurry to the Instant Pot and use a whisk to stir it while it heats. Once the sauce has thickened, turn off the machine and serve the chicken with the sauce. That’s it you are done! On the chance that you made a saute’d vegetable, you could also drizzle some sauce over it too. In the instructions, Kim listed seasoning the chicken before sauteing as optional. Technically, yes it’s an optional step and if you have a sodium concern then skip it. However, in our house, we always pre-season meat before we cook it. That habit alone, will vastly improve the flavor of your meals. In fact, if we had to watch our sodium intake closely, I would still pre-season meat, then reduce the salt in the rest of the recipe. Most of us will likely serve a side dish with this chicken. Instead waiting for the chicken to finish, then making your sides, why not use that time more effectively. For example, you have around 20-minutes of dead time. Use that to prepare some vegetables. Depending on what you choose, it only takes 7-10 minutes to saute fresh green beans or 9-12 minutes (including the time to bring water to a boil) to blanch broccoli. 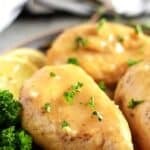 One of the questions I see listed on Google is, “How do you make baked lemon chicken?” Well, you can use this recipe. Simply preheat your oven to 350 degrees F. and season the chicken with salt and pepper. Then take a 9×13-inch baking and lay each breast into the pan. Top each one with a fresh lemon slice and a sprig of thyme. Then, sprinkle the diced onion and minced garlic over the meat and pour in the chicken broth and lemon juice (omit the oil). 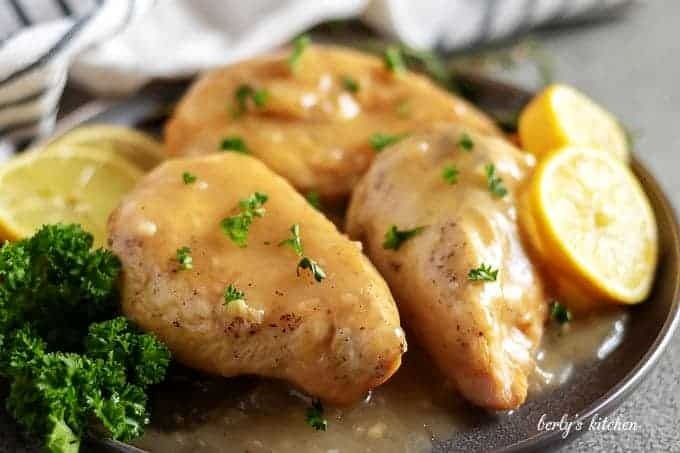 Bake the lemon chicken for 20-25 minutes. Remove it from the oven and carefully remove the chicken breasts. Now, the sauce is optional, as you could just drizzle the juices from the dish over each breast. If you want to make the sauce, grab a saucepan and scrape the pan drippings (from the baking dish) into the pan. Sprinkle about 1-2 tablespoons of all-purpose flour over the drippings. Over medium heat, cook the flour for 2-3 minutes, then add more chicken broth as needed. You’re basically making lemon gravy. Once the desired thickness has been reached, you are done! 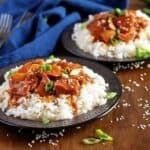 Need more Instant Pot recipes? Then take a look at some of our newest posts! 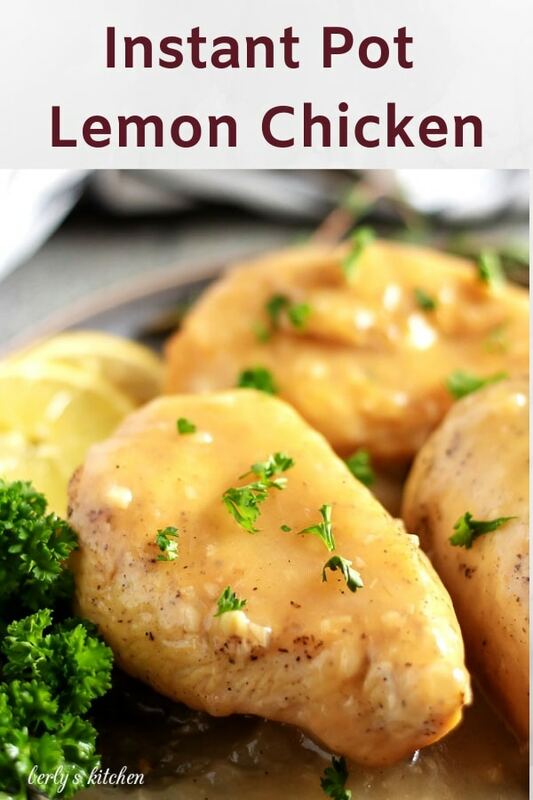 If you like our Instant Pot Lemon Chicken recipe, please leave us a comment and rate the recipe card. You can also find us on Facebook, Pinterest, Twitter and Instagram searching for Berly’s Kitchen! 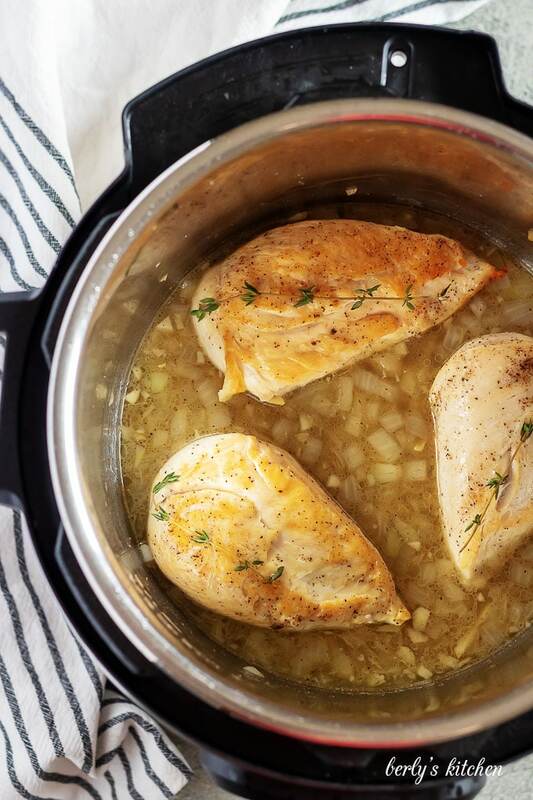 Season the chicken with extra salt and pepper (optional), then set aside while the Instant Pot gets hot. Turn the Instant Pot on using the saute function. Allow the liner to get hot, then add the oil. Add the chicken breasts to the pot and cook for 3-4 minutes on each side. Keep the Instant Pot on saute, and add the onions. Use a wooden spoon or spatula to stir the onions. Cook until soft, about 3-5 minutes, then add the garlic, salt, and pepper. Cook an additional 30 seconds. Turn off the Instant Pot. Pour in the chicken broth and lemon juice. Stir to combine. Add the chicken breasts back to the pot in a single layer. Top each with a fresh thyme sprig if using. Close the lid, and set the valve to sealing. Use the manual (pressure cook) button and adjust the time to 8 minutes (per pound). After the time is up, allow a natural release for at least 10 minutes, more is better. Open the valve to release any remaining pressure. Combine the cornstarch and cold water to make a slurry. Add the slurry to the Instant Pot and turn on to saute. Whisk to combine and allow to thicken. Serve the chicken in the sauce or drizzle the sauce over the chicken. Chicken can be served with rice, pasta, or steamed vegetables. 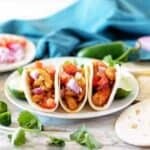 The calories listed are an approximation based on the ingredients and a serving size of four (4) ounces of chicken breast. Actual calories will vary. 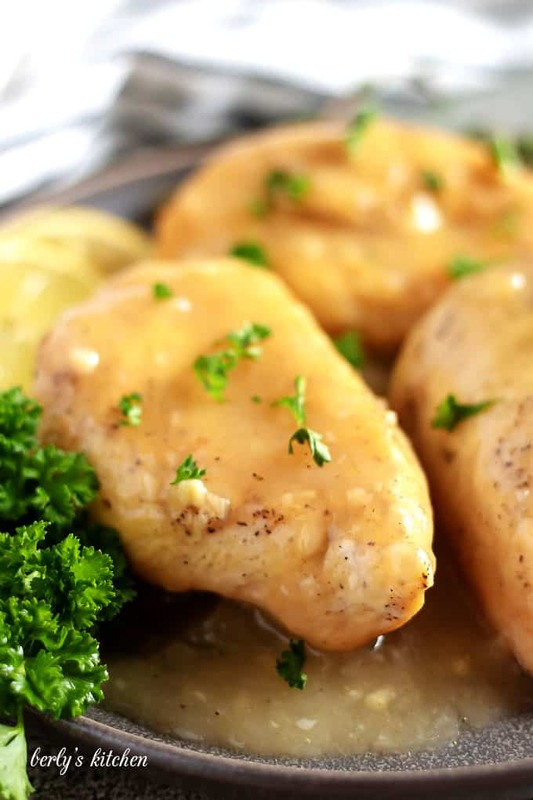 The lemon chicken can be stored in your fridge in a sealed container for up to three (3) days.